We are very satisfied with our recaro denali stroller. Shipping came fast from albee baby. Stroller isn't too heavy and is super easy to maneuver. The quick flip recline and full adjustment of the leveling knob is needed in both mine and my wife's cars to bring the leveling bubble into range. The problem is the quick flip recline does not lock into place and eventually collapses down while driving, causing the seat to be loose enough to almost tip over. A secondary issue with the base is that it positions the seat very far forward, making it very difficult to fit an adult in the seat ahead of it. Our cars are popular mid size vehicles. We purchased this product because we had the infant car seat and wanted something that it was compatible with. It was easy to put together; just pop on wheels and your ready to go. Now we have had this stroller for about a year and it is terrible. Screws are coming loose and front wheels do not seem to go straight. It is always wobbly. I would not recommend this stroller to any of my family or friends. We have been using this stroller for about a year now to go along with the infant bucket seat and we are extremely pleased. It is absolutely gorgeous - very modern and sleek! It was very easy and quick to take out of the box and put right to use. The storage underneath is sufficient and larger than I thought it would be. It is very easy to fold down the snack tray to set the infant seat into it. It took a bit of getting used to get the seat to latch in, but once I got the hang of it, it was simple. The ride on this stroller is very smoothe and easy to maneuver. Very easy to fold and store. I would definitely recommend this stroller! Our little girl has not arrived yet so I can't review for actual useage, but I like the way the stroller folds up, the access to the bottom storage, lightweight, quality materials, foot brake, easily turns, doesn't take up as much space when folded as other stroller. It also has a pouch for storage on the back side, which I did not know until we received it, and has coated area for the childs feet to easily clean. So far, we are impressed and have not found anything of better quality. This stroller right out of the box was so easy to setup and use. As a parent the last thing you want to be doing is fussing around opening your stroller. You will never do that with this stroller all you do is unfold and go. When ready to close up push the unlock button, refold, grab by the built-in handle, and go! It doesn't get any simpler. Same goes for the carseat when using. The design is very sleek. Very large canopy along with a large underneath basket. Excellent stroller highly recommend!!!! RECARO does it again -- Excellent product! RECARO does it again! I decided to purchase this product along with the RECARO Coupe Infant Seat for the newest addition to the family. All of my friends and family are strong believers in RECARO. RECARO's product combine great value with some of the best quality out there in the market today. The attention to detail on the Denali stroller is incredible. I love the sleek design. I receive many compliments when I take the stroller and my son out shopping. The spacious storage basket underneath is an excellent feature and is easily accessed. The stroller has a light weight frame and folds down very compact. I can get the stroller in and out of my car without a problem and I have a Nissan Altima. I love that the adapter is built in with the child tray. The fact that I don't have to mess with extra spare or loose parts is perfect for my sometimes busy schedule. The Denali stroller comes with everything you will need: Cup holder, Child Tray, and build in adapters. I was looking for a sleek, lightweight stroller, and the Denali was a perfect choice! Not only does it look amazing, it is easy to maneuver and I can collapse it and put it in the trunk with one hand while holding my child with the other. I do tend to hit my foot on the brake while walking though. My toddler is also quite small for her age and she has trouble reaching the tray. It seems further out than our jogging stroller. All in all, I do love the stroller and would recommend it to others. This stroller works great with the recaro infant car seat. Its easy to attach the car seat to it and take off. 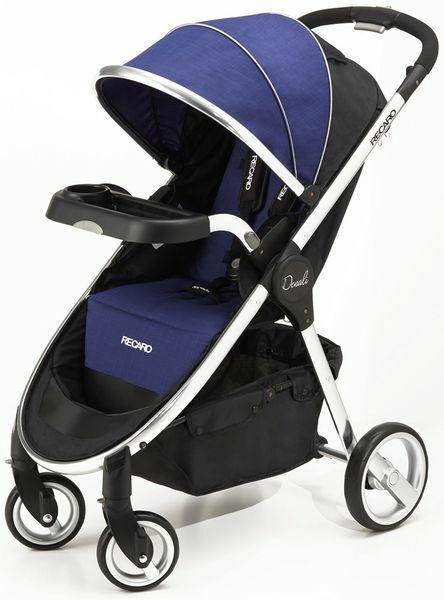 The recaro denali is a sleek stroller featuring rubber wheels, suspension, 5pt harness, fold away childs tray! The seat dimensions are: Width 14.5" Depth 9.5" Height 18" And height to canopy at 21"
In a class if it's own elite! It's in a class of its own nicely made very detailed. We were anxiously awaiting the release of the Recaro travel system. Luckily it was released just in time for my son's Sept birth! The stroller and infant seat will not disappoint! They are of great quality. The stroller is light enough to easily lift in and out of the truck and can be unfolded and set up with one hand. The infant seat snaps right in. I like that the folding canopy on the stroller meets the one on the seat to enclose the baby. There is no other travel system that compares! This is very high quality and worth every penny!! This stroller is awesome. My favorite features are the one hand fold which is super handy while trying to hold a diaper bag & baby in the other hand. The stroller isn't too heavy to lift which is a plus. Recaro did a great job designing this stroller it's very sleek looking and rides so smoothly. Wish we splurged for the travel system but still overall super happy with the stroller by it's self. Our son just turned 1 and is only 20 lbs so he's going to be riding in style for a long time, love the 50 lb. weight limit. As my husband an I own Recaro bucket seats for one of our cars we are very familiar with their products. We already own 2 recaro performance car seats for our daughter it was only right for us to purchase this Denali stroller for her. What can I say I ABSOLUTELY LOVED IT!!!!!! Its so light weight, super easy to fold, and not bulky whatsoever!!! Overall just a great stoller just perfect for my family. I won this in a Facebook contest for my grandbaby who will arrive in February. This stroller is very nice, easy to use, and comfortable for baby and the adult pushing. It folds and unfolds easily. It pushes and turns smoothly and easily, even with a 50 pound child in it. The only complaint we have is how difficult it is to click the car seat on. Very well made and comfortable and performance. This stroller is great. With shocks to keep child from feeling all the bumps. Easy to put together. One hand release to open and close. Easy to store. Very durable. Everything I've been looking for! My husband bought me this stroller after being so disappointed with past strollers. I must say this stroller hits the nail on the head! First, it folds and unfolds super easy, the basket underneath is huge, it rolls as smooth as a jogging stroller and turns just as easy. The child tray folds down to accommodate the match in car seat(I didn't buy but see how easy it accommodates it), and removes way easier than any other stroller I've used. I got the green one and love the color! Not too bright, deep, or dull. Oh and the brake is so easy to engage that at first I was double checking it to see if I wasnt engaging it or it was just that easy. Overall, I really like this stroller and believe it's the very last one I will have bought! I have received so many compliments while using this stroller. It is very modern and sleek. Nice design, fits well in my small trunk. Lots of storage space for the diaper bag, keys, cell phone, etc. Great product. The RECARO Performance Denali Stroller exemplifies performance in every detail. The Performance Denali is designed to fit your active lifestyle. Its built-in accessories and intuitive features deliver the comfort and style you have come to expect from RECARO. The stylish, chrome frame and woven luxe fabrics in luminous color options, harmonize to create a chic look. The Performance Denali is as comfortable for you as it is for your child. RECARO pays attention to the details, enabling us to craft the best performance inspired comfort features in our class. The breathable yet protective fabric on the extra-large, multi-position canopy offers UV SPF 50+ and a water repellant coating to shade your little one from the sun and rain. The temperature balancing, woven luxe fabric on the seat is comfortable and soft on your child’s skin. The parent peekaboo mesh window on the canopy provides ventilation while giving you a convenient view. The over-sized storage basket is one of the largest on the market, allowing for easy access even when the seat back is fully reclined. The included parent cup holder can be secured on either side of the push handle and features an elastic mesh pocket for extra storage. The 2-in-1 removable child’s tray doubles as an infant seat adapter for the RECARO Performance Coupe. A pedicure friendly, double push brake is quick to engage and prevents shoe scuffs. The easy to fasten wheels have a locked setting to prohibit swiveling and also feature a front and back wheel suspension system for easily traversing any terrain. The Performance Denali also features a quick, multi-position recline seat that allows a custom fit for your child. The seat back parent storage pocket adds additional space to store keys or other small items that need to be easily accessible. The stroller’s intuitive, one-handed fold has a locking feature that ensures it is secure when engaged while standing on its own when folded. The RECARO Performance Denali Stroller is designed to accommodate the RECARO Performance Coupe Infant Seat. It is travel system ready with QuickSnap, built-in adapters that required no assembly or extra parts. The adapter for the Performance Coupe is built in to the child’s tray on the Performance Denali. The 2-in-1 child’s tray connects easily to the stroller and simply flips down to be used as an adapter, adding convenience when you’re on the go. The child’s tray, infant seat adapters and the parent cup holder are all included with the Performance Denali.